The Little Dipper is a beautiful groundcover with red berries that is also a striking addition to any landscape or garden setting. Not a walk-on ground cover. 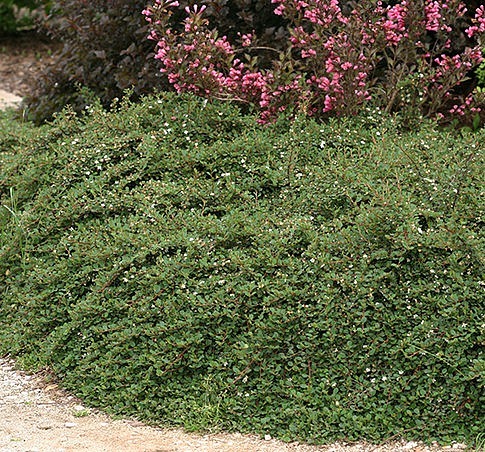 Covering large areas with its 4 to 5 foot spread, the Little Dipper Cotoneaster is a faster growing groundcovering shrub. Tiny white blooms in spring turn to small red fruit over summer. Good for planting near retaining walls and tall edges. An easy way to remember how to pronounce this variety is 'co-tone-e-aster'. Little Dipper Cotoneaster ships as a one quart container grown plant. Orders shipping to AZ or CA will be bare rooted and root washed before being prepped for shipping.